This all new TV show, being simultaneously released on DVD features Mack, a lovable, moose-like lummox, and Moxy, a feisty whirlwind of a raccoon/fox go-getter, on four exciting adventures! Together with a helpful Trooper, Mack & Moxy set out to rescue another Great Helpee in a far off mystical place called HelpeeLand. Along the way, Mack & Moxy meet a new Friend in Need who ends up teaching us a new important cause. Guest celebrity, Josh Duhamel (Transformers, All My Children), helps the Heroes’ mission in support of Save the Children, providing quality preschool programs to under-served children around the world since 1932. 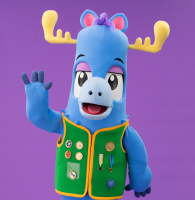 In this DVD, Mack & Moxy introduce us to Save the Children, American Red Cross, Feeding America and World Wildlife Fund. KIDS FIRST! Film Critic Abigail Zoe L. comments, “I learned a lot about different ways to care for others, compassion, important causes and the joy of helping others. In short, I learned what it is to be a humanitarian.” See her full review below. The Mack & Moxy: The Great Helpee Heroes DVD is great! It is as entertaining as it is educational. I learned a lot about different ways to care for others, compassion, important causes and the joy of helping others. In short, I learned what it is to be a humanitarian. This DVD features four different episodes from the new children’s TV show, Mack & Moxy. In each episode the main characters go to HelpeeLand to save a “Great Helpee” from evil Shelfish Sheldon. This greedy character wants to steal all the happiness in the world just for himself. On their journey, they always meet a friend in need who introduces them to a new and important cause. For example, in “Feeding Rainbow” we learn about the charity organization, “Feeding America” that provides hunger-relief through food banks/pantries for those who can’t afford to purchase their own food. In the episode “Always be Prepared,” we learn the importance of Emergency Preparedness and about the American Red Cross organization. Basically, we learn things about what to do in scary situations such as, if there is a fire, we should not grab a thing, “get low and go” and have a plan of action. My favorite episode is a “Ty-Grrrr’s Tale” because it is about saving tigers and I love animals. We also learn about the World Wildlife Fund that helps raise awareness and money to help and protect animals. I love that each episode has a special celebrity guest. My favorite actor on this DVD is, Josh Duhamel who plays the Admirable in the episode, “Save The Children.” He reminds us the importance of early education. I really like Josh because he’s funny and entertaining. The message of this DVD, like the show, is about inspiring children to become great humanitarians. I actually had an opportunity to visit a live taping of the show and interview both the creator of the show, Brahm Wenger and Kelly McQuinn, the Co-Executive Producer. One of the things they shared was that the show teaches children in the language that they know. They explained that this is done with the show’s bright colored characters, fun music, songs, dance and awesome stories that teach humanitarian lessons. They also shared how excited they are to be part of America’s first kid’s TV show about causes. I believe 3 to 8-year-olds will really like this DVD and TV show with its adventurous stories, fun music and lively characters. I give the show five out of five stars, or should I say humanitarian stars. Finally, I hope that you too will find a cause from this DVD or in your own life that inspires you to become one of the next generation’s great humanitarians. This DVD is available in stores on May 24, 2016 so be sure to check it out. It’s no secret that many young kids can’t stand the look, let alone taste, of vegetables. In her cookbook The Help Yourself Cookbook For Kids ($20), author Ruby Roth set out to createkid-friendly versions of plant-based recipes that they’ll actually want to eat. She shared some of her secrets with us to get our children involved with creating their own healthier lifestyle — whether that means going full-on vegan or incorporating a vegetable or two into an ordinary family meal. Read through for four of her tips to help your own children become more into the idea of healthier foods. 1. Let your kiddo do the cooking. Roth told us that she believes “as a society we do not give kids the credit they deserve as far as their capabilities,” and that we should give them more responsibilities when it comes to cooking and food. By introducing your kiddo to the wonders of the kitchen from a young age, they will become familiar with ingredients, be able to feel pride in making something “all by themselves,” and are so much more likely to eat the food they’re helping to cook — especially if they’re on the pickier side. 2. Use kid-language and simplified instructions to keep it fun. Even if what you’re whipping up is broccoli soup, you can make it fun for a child to make and eat with you (Roth calls her broccoli soup “Broc-O-Tree Bisque”). She tries to simplify most of her recipes to include around five ingredients, and writes cooking directions in a language that kids can understand and have fun with. So broccoli soup may not sound like something your kid would touch with a 10-foot pole right now, but if you call it broc-o-tree bisque and let them help you smash the cooked broccoli, who knows? 3. Focus on healthy things your family can eat, rather than things that are being taken away. If you’re trying to get rid of boxed mac-and-cheese in your house, focus on a new recipe that you can make as a family. Stock the pantry and refrigerator with healthy ingredients — Roth says that fruits and veggies can be “eye candy” — that your kids can learn how to make delicious recipes with, rather than the fact that you may be taking something unhealthy out of the repertoire. They’ll be so excited about the new recipes they learned and love, they might even forget you ever resorted to mac-and-cheese every night before now (one can dream). 4. Teach kids about healthy ingredients and nutrient-rich superfoods. If being healthy is something important to you and your family, educate your kids. If you know a ton about the health benefits of spinach, explain to your child what they are — even if it’s in kid-terms — before you put a plate of the stuff in front of them. They’ll be more likely to eat something that will make them “run faster” or “be big and strong,” and will become more inclined to make those healthier choices as they grow up. If you’re looking to make some healthy changes in your house and get your little ones involved in cooking their own meals, scroll through for a sample of recipes from Roth’s cookbook with your kids.